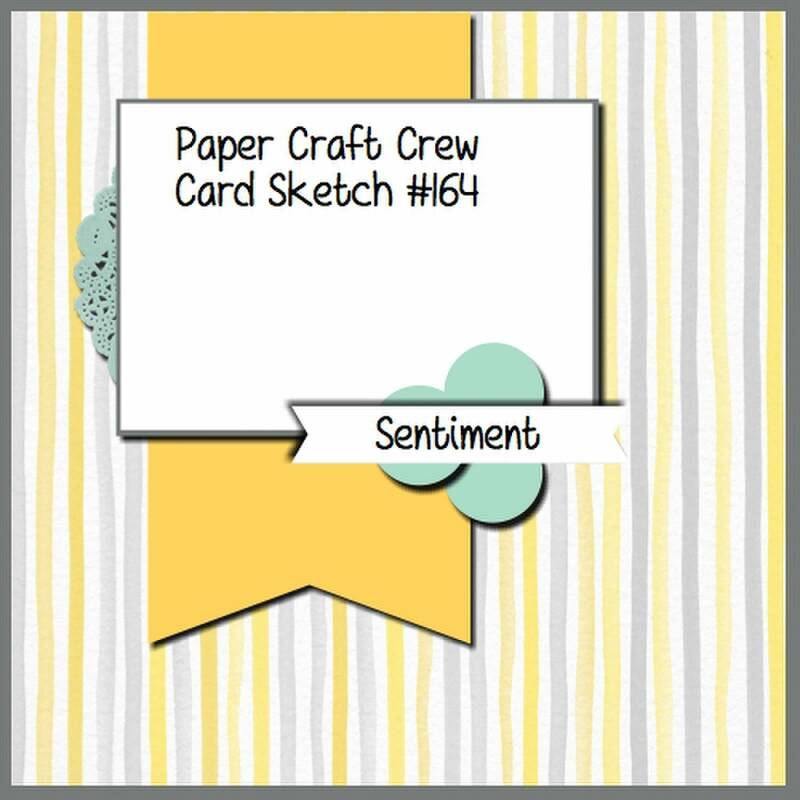 Hello again, my friend – welcome to another challenge with the Paper Craft Crew! We’ve had an awesome response to our last challenge, which was the Tic-Tac-Toe; I guess you really liked the change! There’s some amazing submissions – I hope you got yours in on time; I know it’ll be tough voting by us design team members to choose only the Top 3! The stamp set is called Snow Place, and it’s an adorable 22 piece photopolymer set with these cute snow people, a penguin and lots of accessories for dressing them up 🙂 You can also Bundle the stamp set with the coordinating Snow Friends Framelits Dies, and save 15%! Of course, you know what I did! I started by stamping the snowmen onto Whisper White cardstock in Archival Black ink. I then stamped the bow ties, arms and buttons onto scrap Whisper White in Real Red, Archival Black and Tip Top Taupe, and used the Big Shot & Snow Friends Framelits Dies to cut them out. Once I added the accessories, I used my Stampin’ Write Markers in Wisteria Wonder and Soft Sky to add some shading to the snowmen and the snow. I used the same stamp set to stamp the snowflakes in Soft Sky in the background; then stamped the sentiment and candy cane onto more Whisper White scraps in Pool Party and Real Red. I used the Framelits to die cut the candy cane, and just used my Paper Snips to cut banner tails on each end of the sentiment banner. The 3 circles you see behind the sentiment & candy cane were punched with the 1″ Circle Punch, and sponged with Soft Sky ink and a Sponge Dauber to represent snowballs! To assemble the card, I started with a card base of Pool Party cardstock, topped with a panel of Real Red and layered with a piece of Home for Christmas Designer Series Paper. I added a panel of Real Red cardstock behind the stamped panel, and attached a Silver Foil Doily peeking out to the left side.I placed a large banner piece of Pool Party cardstock down the centre of the card, and layered the image panel on top. 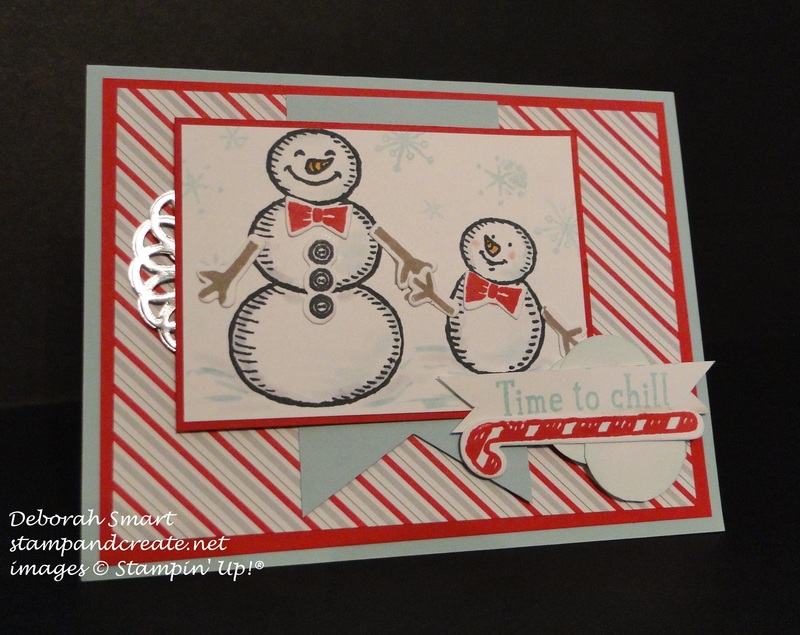 Finally, I added the sentiment with candy cane and snowballs to finish off the card. I know I’m going to have lots of fun using this stamp set; this was my first card, using it, and my imagination is taking off! I hope you enjoyed seeing my card; if you have time, I’d appreciate it if you could leave a comment; I love reading what you have to say. Now, be sure to head over to the Paper Craft Crew page to check out the rest of the amazing projects designed for your inspiration by the rest of the design team! Then pull out your favourite stamp set, and join in the fun! I’ll be looking for you there. Until next time – happy stamping! Next Next post: Blogging Friends Blog Hop!